PB/PC series by-pass valves are designed to protect pumps and system components from excessive perssure damage. The by-pass valves can be setted between 0-15 bar. With only two moving parts, operation is simple and reliable. By-pass valve is one of the most important component for the LPG and anhydraous ammonia handling applications. Fluid forces to open the poppet of the by-pass valve as the pressure raises in the discharge pipeline instantly. If the pressure raised greater than the setting pressure, pressurized spring lets the poppet to open and start by-pass circulation. Fluid returns into feed tank. Circulation over a long period of time through the by-pass valve causes a significant heating up. By-Pass vallve is one of the most important for the LPG and anhydrous ammonia handling applications. 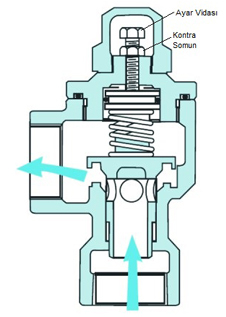 By-Pass valve opens precisely at the preset spring even if the capacity cahnges. By-pass valve has only two mpving parts which provides simple and safe construction.